The Charleston Golf Week Tour headed up interstate 95 to take on Santee National. As usual the course was a little crowed and also as usual, the course was very good shape! After most everyone had a little scare about missing their tee time due to big accident on interstate 26, we got settle in and had a great tournament. Chris Asbell, showed everyone he is in great form heading into the heart of the schedule by firing a Super round of one under par, 71 to take top honors in the Championship Flight. This is the first under par round on the Charleston this year, congratulations Chris. Coming in second was new comer Marty Bunch who is looking forward to the bigger events on the schedule. Marty posted a solid round of 77. In the A flight, Wade Schaffner from Myrtle Beach made the trek down and fired a 77 to take top honors in the A flight. It was a little drive for Wade and he made the most of it. Coming in second was Fred Dixon who continued his solid play of late with a solid round of 78. On a side note, Fred did shoot an under par round on the Myrtle beach tour last month, so congrats to Fred as well! Rounding out the top three with a nice round of 79 was Steph Jones. In the B flight, Jerry Mat withstood an onslaught of golfers right on his heels and posted an 81 for a one shot victory over Marc Godzi who shot 82. 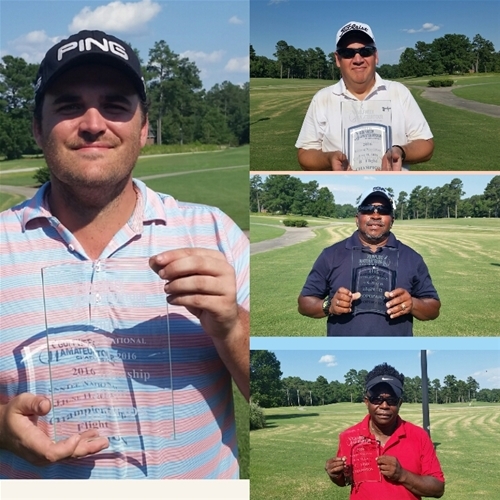 Four golfers tied for third, Randy Tame, Billy Gamblin, Denny Miller and Tim Sumption all carded 83’s and on the show of cards it was Randy who took home the third place prize money! There was also an 84 and an 85 on the scoreboard in the B flight. The C flight had a first time winner as Willies Stephens fired an 84 for his first victory on tour! Way to go Willie. Coming in second was Jack Overfield visiting from Western New York. The D flight saw the hottest member of the tour take top honors once again as Vince Ackerman shot a solid round of 89 for a two shot victory over Mike Miller. It turned out to be a great day, a little warm but no threat of rain anywhere. Up next is Charleston National on Jun 25th. This will be the last event before the Southern Regional next month. If you want to play shoot me an email or sign up online.